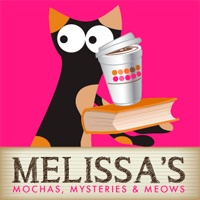 Melissa's Mochas, Mysteries and Meows: My 5 Favorite Cat Coloring Books...So Far! When I was a little girl I was obsessed with coloring. Any visitor to my house, friend or family member, had to color with me. It was a rule. One Christmas I received a 'Twas the Night Before Christmas coloring book from my aunt and uncle. It was so big I could only work on it at the dining room table. Each year in December I worked on one page and my mom dated it when I was done. I still have that book too...a cherished piece of my childhood filled with so many memories. Coloring is cool again and more popular than ever...for adults! It's finally being recognized as the amazing stress reliever it is, as well as a creative outlet for children of all ages. Color Cats Book One: Coloring Pages for Adults by Margaret Gates Root What I love about this book is it's filled with cats doing "cat stuff"...lying in the middle of your desk, acting innocent after knocking over a flower vase, eating breakfast on top of the dining room table! The drawings are presented as single-sided images in landscape view, with the binding at the top of the images. So, they're friendly for right or left-handed colorists. No binding to get in the way. 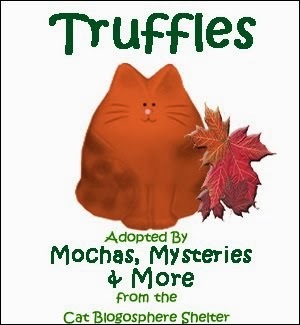 If you would like to view thumbnails of all 32 drawings or download sample pages, visit colorcats.org. 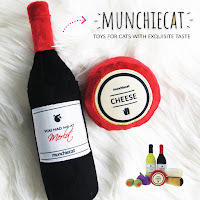 For US orders, a portion of the purchase price benefits the Feline Nutrition Foundation, a non-profit advocacy organization focused on better nutrition for companion cats. I adore the dedication page too: "This book is dedicated to the best cat ever...yours." I can't wait for the release of Book Two! Disclaimer: I received a free copy of this book from the author with the request for a review. 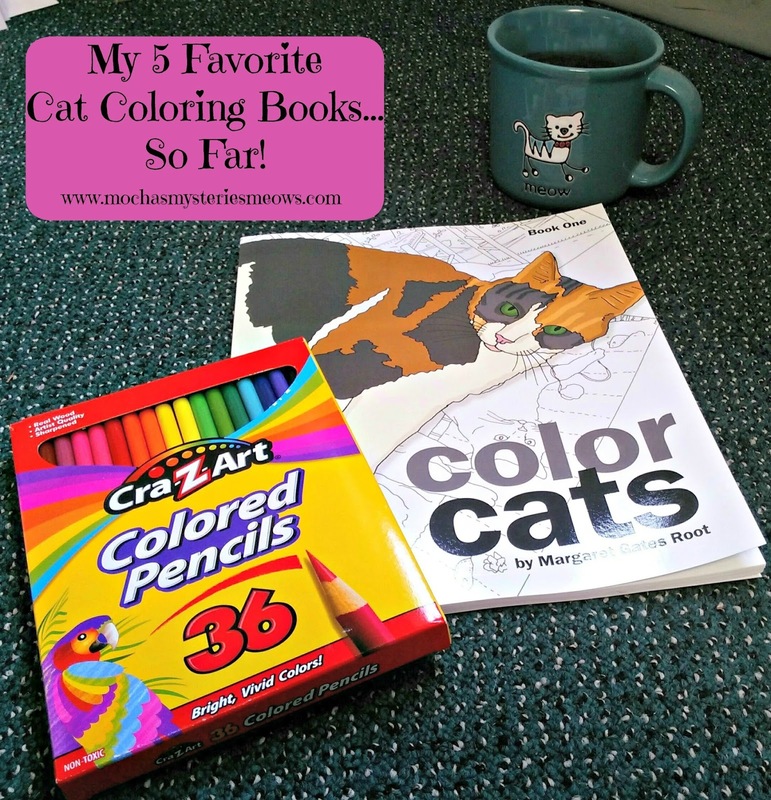 Reviewing a free copy did not influence my opinion in any way...I love this coloring book! 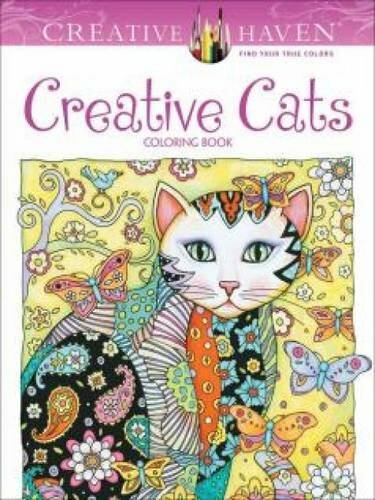 Creative Haven Creative Cats Coloring Book I would say this is the most popular cat coloring book on the market right now. 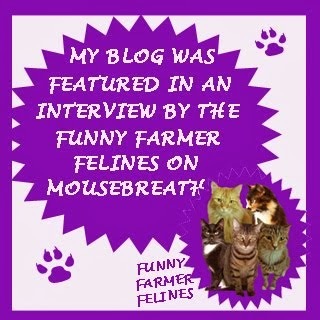 The images are fun and whimsical...purr-fect for bright and vibrant colors. More than 30 full-page portraits of pretty pussycats form a rich tapestry of motifs that includes hearts, flowers, and paisleys in various patterns. Pages are perforated and printed on one side only for easy removal and display. 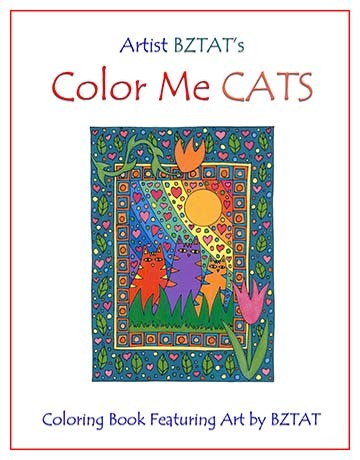 I received a copy of this book as a gift from a treasured friend, and it inspired my desire to reconnect with my coloring passion. Santa's Cats by Jason Hamilton This little gem is a Christmas coloring book that contains twenty four timeless, unique illustrations of cats and kittens getting into trouble, helping Santa and his elves as they prepare for the big day, and cuddling up with Jolly Old St Nick after an exhausting day in the workshop at the North Pole. As a Christmas fanatic I can easily see myself coloring in this book all year long, because I'm always ready to feel the Christmas spirit. Each picture is printed on one side of 60 lb pure white paper to minimize scoring and bleed-through, and appears in two sizes: large and half size (4"x6"), both suitable for framing when complete. 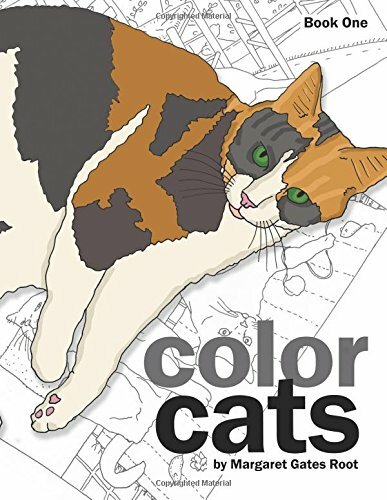 Artist BZTAT’s Color Me Cats Coloring Book Artist BZTAT has a style all her own. Her love of animals inspires her art, and that is apparent on every single page of this unique book of 25 original line drawings. The drawings are intricately arranged to present creative challenges for adult colorists, yet are inspired by the art of children. The book is spiral bound to make the drawings easier to color within the book; each coloring page is perforated and printed only on one side in case the colorist wants to easily remove the page from the book; and the pages are printed on heavy paper stock to prevent bleeding if the colorist chooses markers as their coloring media. 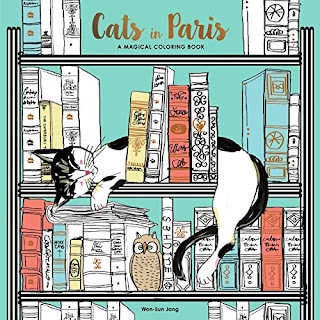 Any pet loving (yes, there are a couple dogs here too) coloring enthusiast would be thrilled to find this charming book under the tree on Christmas morning! 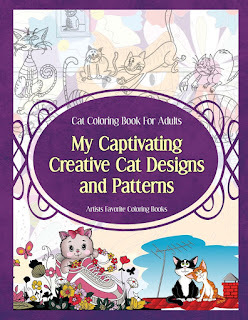 My Captivating Creative Cat Designs and Patterns by Grace Sure I picked this book up for free as a Kindle download (it's currently $1.99). I'm sure you're wondering how you're supposed to color a Kindle book. There's a special link at the back of the book that will allow you to download all of the images to print out as many copies as you want! Perfect for someone just starting out who doesn't want to practice in a beautiful print book. Have you been bit by the coloring bug yet? 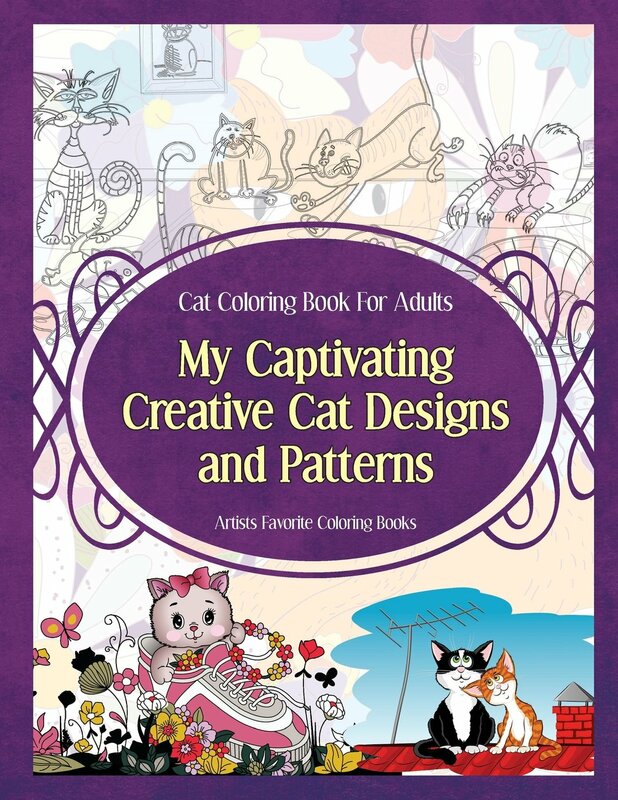 Are cats your favorite thing to color? Do you have any favorite books to recommend? I've always loved coloring too and was thinking of creating a coloring book but then found out there are gazillions. This is a nice selection. I have started coloring digital stamps which has been fun. I haven't tried a whole coloring book yet. On my wish list are the coloring books by Molly Harrison (mostly fantasy theme. 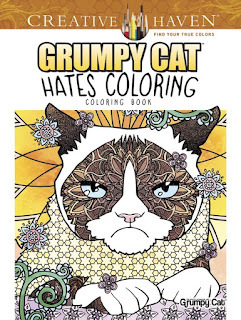 We don't think Grumpy Cat wants to join in and help colour the books! That's quite a collection! The head peep says she can't slow down long enough for coloring books. She obviously needs to learn from us cats how to take things slowly. Those look like great coloring books. We might have to give that a try. Looks like fun. Mom might enjoy doing that. Thanks for that great review. I just started coloring when I received Color Cats from the creator (I'll be posting about it on Sunday) and I think I'm hooked! The mom hasn't gotten into coloring yet. She used to when she was a kid...but she just hasn't found the time to do it now. I just recently discovered and downloaded a coloring app on my Kindle. Now I'm hooked. 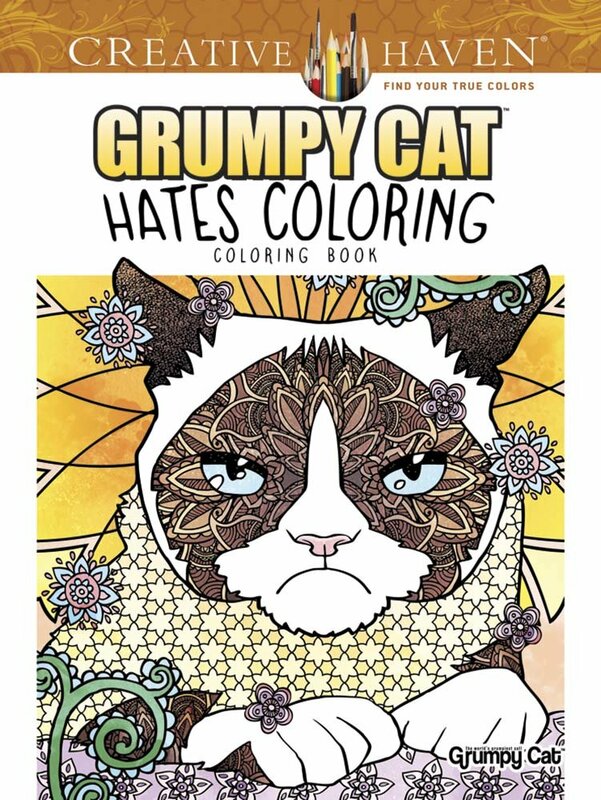 Of course, I quickly burnt through all of the cat coloring pages on that app, so now I'm in need of more. Good thing you gave so many pawesome options here! Purrs and happy coloring! Those all look like so much fun! 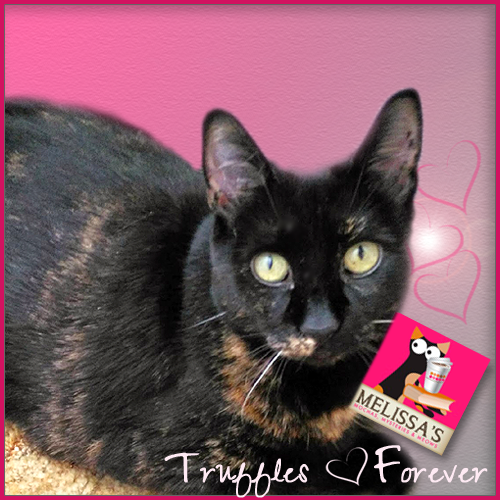 Thanks, Melissa. My daughter enjoys coloring mandalas. 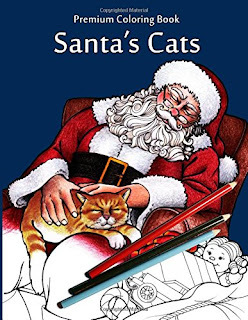 I think I would enjoy the Santa's Cats. 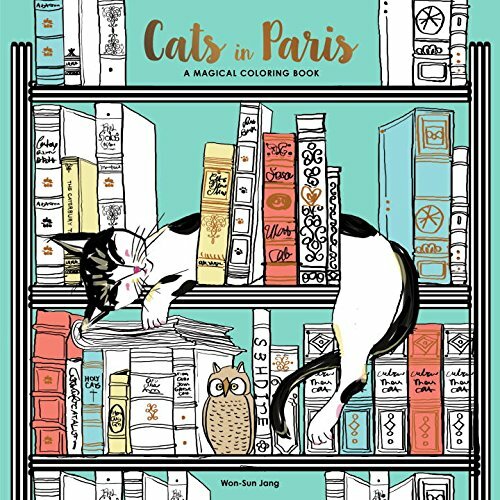 We never knew there were cat coloring books!!! These are very cool. We'll put them on mom's wish list. 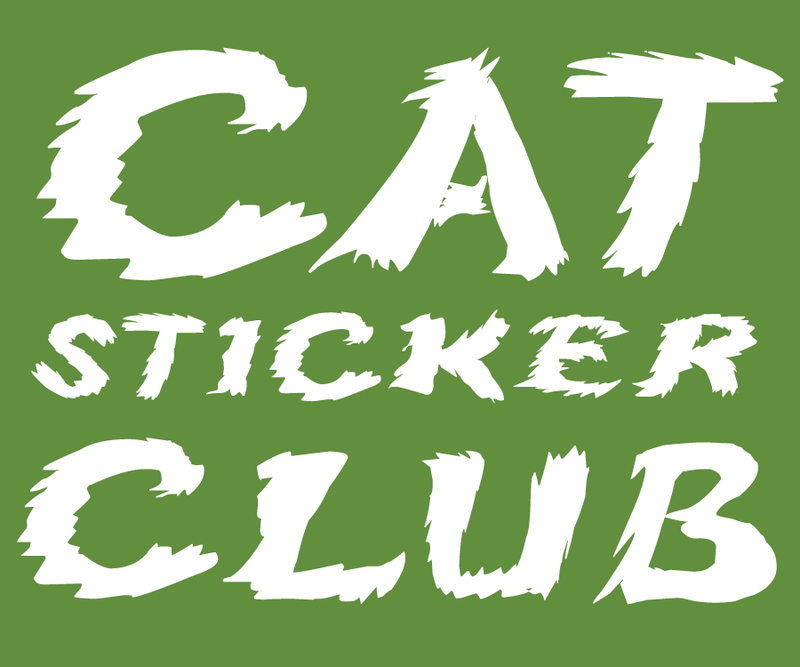 I love the Santa's cats one. Now I know which ones to buy that are on my wish list. I just bought creative cats on Amazon. One for my daughter and one for me! I DO love coloring with pencils. I love cats for sure. My favorite thing to color however is nature and if I could find a house one, that would be awesome!